Among the structural properties of trabecular bone, the degree of anisotropy is most often found to separate taxa with different habitual locomotor modes. This study examined the degree of anisotropy, the elongation, and primary orientation of trabecular bone in the KNM-ER 1464 Early Pleistocene hominin talus as compared with extant hominoid taxa. Modern human tali were found to have a pattern of relatively anisotropic and elongated trabeculae on the lateral aspect, which was not found in Pan, Gorilla, Pongo, or KNM-ER 1464. 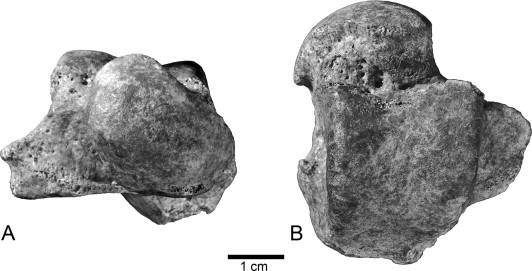 Trabecular anisotropy in the fossil talus most closely resembled that of the African apes except for a region of high anisotropy in the posteromedial talus. The primary orientation of trabeculae in the anteromedial region of KNM-ER 1464 was strikingly different from that of the great apes and very similar to that of modern humans in being directed parallel to the talar neck. These results suggest that, relative to that of modern humans, the anteromedial region of the KNM-ER 1464 talus may have transmitted body weight to the midfoot in a similar manner while the lateral aspect may have been subjected to more variable loading conditions. Figure 1. The KNM-ER 1464 talus is well preserved and displays a mixture of primitive features (deeply grooved trochlea, prominent fibular facet) and derived features (large size and low talar angle). (A) Anterior view, (B) Superior view. Figure 2. Representative CT images of the trabecular bone architecture of modern human, KNM-ER 1464, chimpanzee, gorilla and orangutan tali in the (a) coronal plane, (b) transverse plane, and (c) sagittal plane. Figure 3. 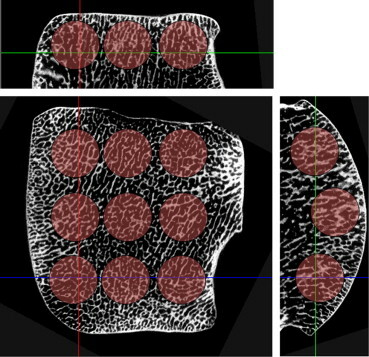 The trabecular bone immediately underlying the talar trochlea was segmented into nine spherical volumes of interest.